While you might still smell the scent of roasted coffee at Roaster’s Block, it’s now because of the upscale coffee bar, which serves brews from Messenger Coffee Co. in Kansas City. It’s just one of the amazing amenities to come out of the construction project that transformed downtown industrial buildings into sought-after living units. 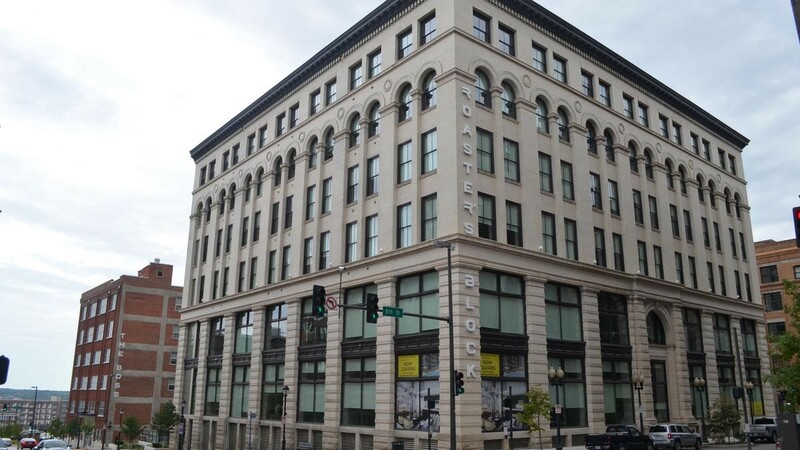 The project, located at 701 Broadway and 33 W. Eighth Street, encompasses the former Folgers building, as well as the six-story Boss Building and the eight-story Swofford Building. The stunning result of this construction project is being highlighted in Multifamily Executive Magazine as the best adaptive use project, which was recently celebrated at the Roaster’s Block during a ribbon-cutting ceremony. Midland Steel is proud to be the steel fabricator and erector for the project, which includes not only the three buildings but also an outdoor pool area, complete with hot tub, gas grills, fire pits and outdoor television. The pool area fills the location where a coffee bean silo once stood between the former manufacturing buildings. The repurposing of the buildings presented some unique challenges, including the removal of the silo. The close proximity of the other buildings made it impossible to use a wrecking ball, so a special 13,000-pound steel blade was designed to be repeatedly dropped on the silo to break it up. It’s hard to imagine that such a silo once stood in a communal area that is now used for hosting Sunday brunches or Saturday night parties with an upscale feel. The Streetside on Roaster’s Block outdoor amenity area is just one of the attractive benefits that Roaster’s Block offers. Besides the pool area and the coffee bar, the community also enjoys perks like communal gathering areas on each floor, electric car charging stations in the garage, free dog walking, free fitness classes and monthly Work from Home events, which include executive leadership seminars several times a year. With all of these features, you’d be ready to move in without even hearing about the actual living units, but they have an attraction all their own. First-floor units feature 25-foot ceilings and some of the original pillars topped with detailed capitals. The units also have larger-than-usual floor plans for urban dwellings. While the construction project could have been designed to fit a few more units in on each floor, the designers were more interested in offering a floor plant that would appeal not just to millennials, but also to empty nesters and baby boomers, as well as executives located in Kansas City. If you’re planning a construction project that requires a unique approach, give Midland Steel a call. We are ready to handle the intricacies of your unique design and the specific challenges of any project.